Of course, if there were a strong relationship between these two variables, we'd expect the points to lie along a 45 degree angle. This doesn't happen; instead, the linear regression line is nearly vertical. 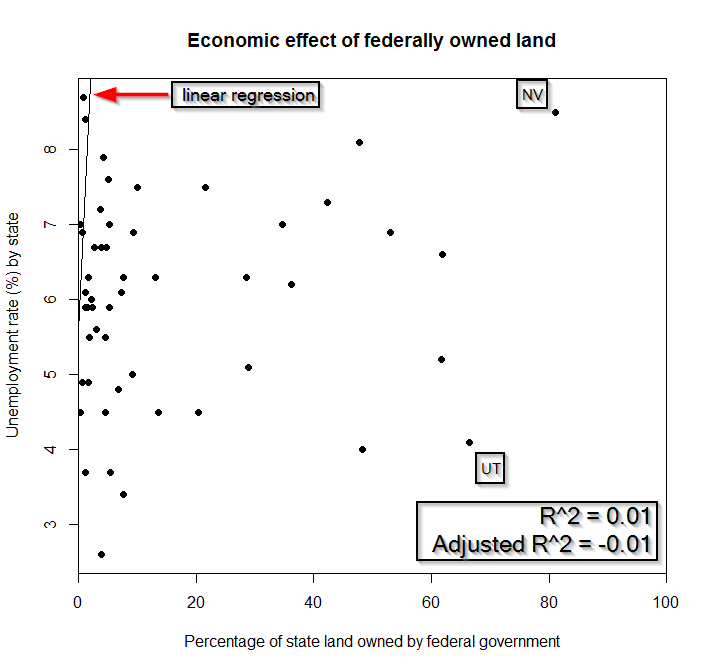 In addition, the R^2 values of 0.01 and -0.01 show that there is no discernible effect of federally owned land on state unemployment rate. Interestingly, Utah and Nevada, the two states with the two highest percentages or federal land holdings, are nearly opposite of each other in terms of recent economic performance. Note: there will be a debate on this land transfer issue at SLC's main library on Wednesday at 7PM. It will be between Reps Ivory and Lockhart on one side, and University of Utah professor Dan McCool and former BLM director Pat Shea on the other.